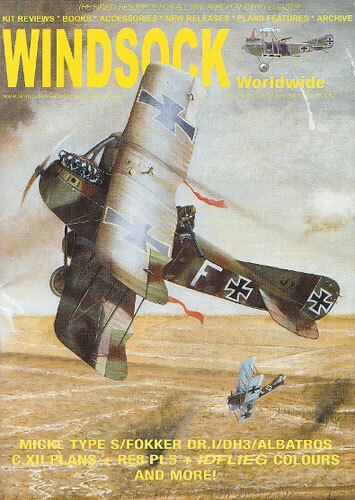 This year’s third issue of Windsock Worldwide is upon us and once again offers a wide variety of material to digest. George Haddow continues his guide to WWI Austro-Hungarian Naval aeroplanes with a look at the Michl Type S31-S60. This is number 14 in the series comes with a selection of general arrangement drawings and colour profiles. The former is the author’s own work and have been competently done in 1:72 scale. Bob Pearson supplies the artwork and these portray early and late versions of S21 as well as the Icarus SM W.14. More scale drawings come in the form of the Albatros C.XII 9314/16 and this time it’s Marty Digmayer that makes the contribution. These are to 1:48 scale and are printed here to coincide with the release of Datafile 129. His revised work on the Fokker Dr.I is also reproduced to this scale and this appears in anticipation of the new Eduard kit. For those that want something a little different to scratch build, the legacy of Ian Stair continues with his line work on the de Havilland DH3. Harry Woodman provides a photo montage on the early efforts to “strike from the air” and Allan Forbes investigates the true nature of the German colours “green”, “brown”, and “lilac”. RE8 Sqns from 1914-1918 are the specialty of Les Rogers and over a dozen images are presented in part 5 of his series. This time it is No 42, 52, and 53 Squadrons that take the limelight. To illustrate the point, more profiles on this topic come courtesy of Bob Pearson. The WWI aeroplane enthusiast gets another 32 pages of interesting and motivating material. Aside from the regular articles from respected writers on the subject, we are treated to a multitude of reviews. Items range from books, kits, figures and accessories. Of course there is a “letters to the editor” page and a news section that keeps the reader up to date on the latest restorations. All in all another informative issue for the “string bag” brigade.